The above photo was not taken by Mars Rover. It was taken by me here on Earth. In Utah to be exact. 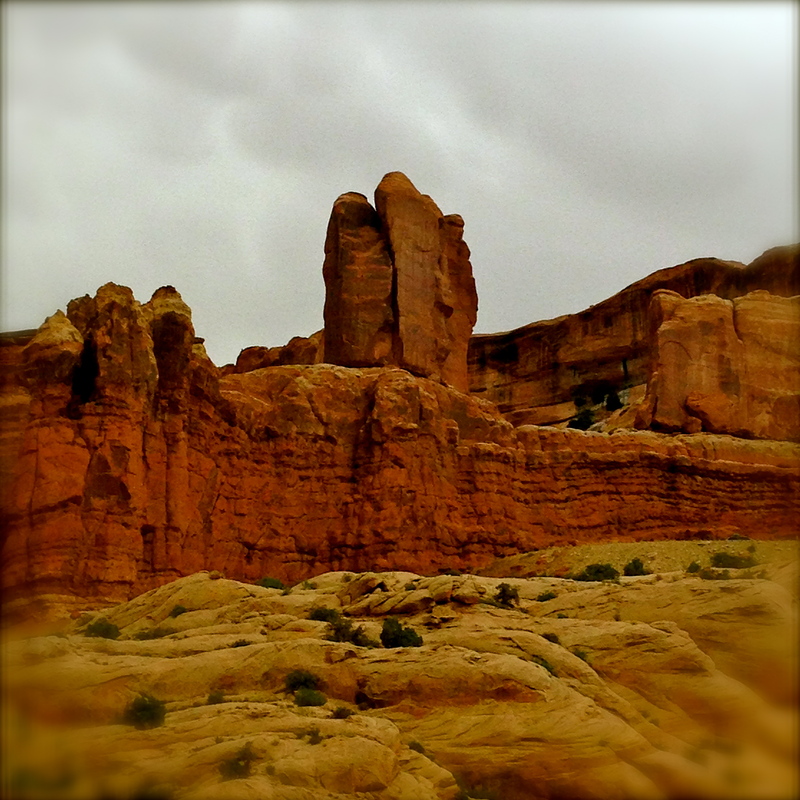 The Arches National Park near Moab, Utah is an interesting place. It has landscapes that has this out-of-this-world feel, like an alien terrain. In fact many Sci-fi movies – like Galaxy Quest, Star Trek, John Carter of Mars, and After Earth, to name a few – were filmed around this place. Of course it is also a popular location for Western movies. 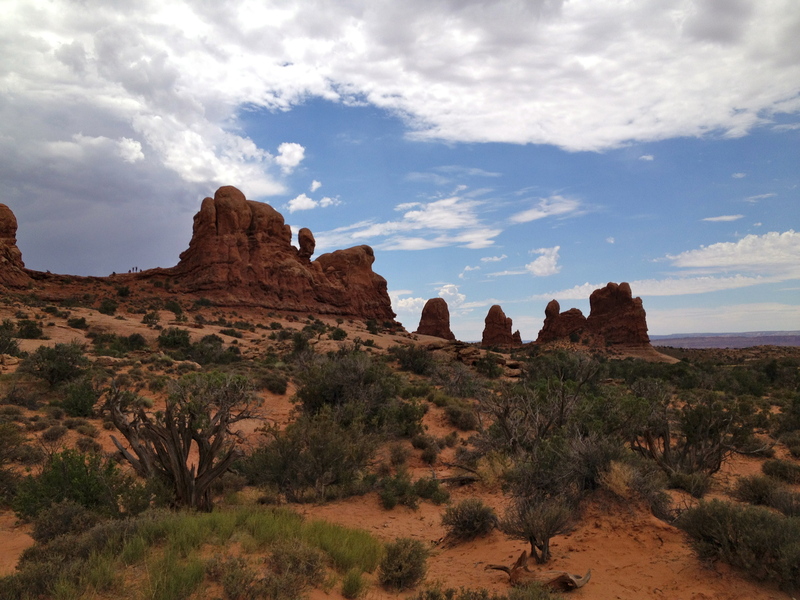 We have visited Moab and the Arches National Park not once but twice, not because we are from Mars. The first time was eight years ago, when we joined a group tour after I attended a doctor’s convention in Salt Lake City. The second time was two weeks ago when we passed by this place on our way to Grand Canyon, Arizona. How long would that rock stay balanced is a fair question. 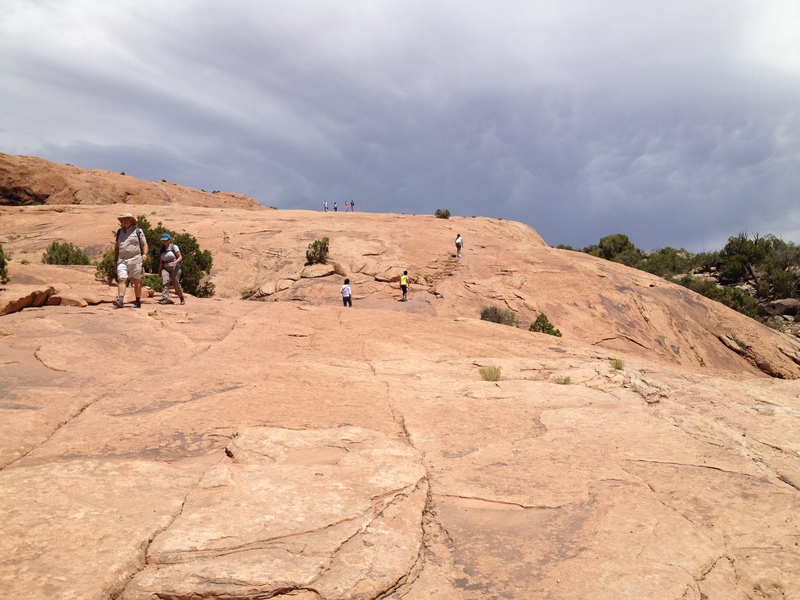 It looks like it would only take a small nudge from Wile E. Coyote, and down the rock would fall. Then there are these building-like structures. Believe it or not the formation below is called “Park Avenue.” It may be similar to Park Avenue in New York City, without the crowd and traffic. 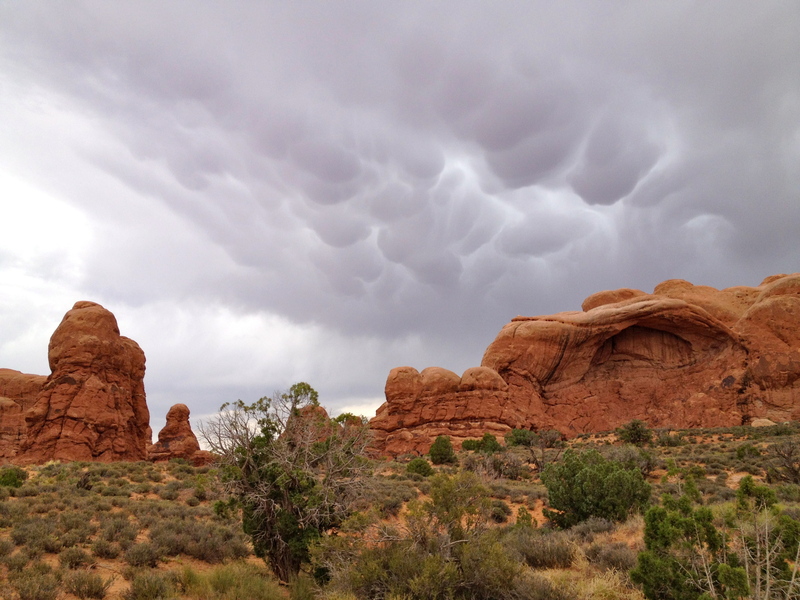 Even the clouds in this place can be out-of-this-world! The photo below is not photoshopped. 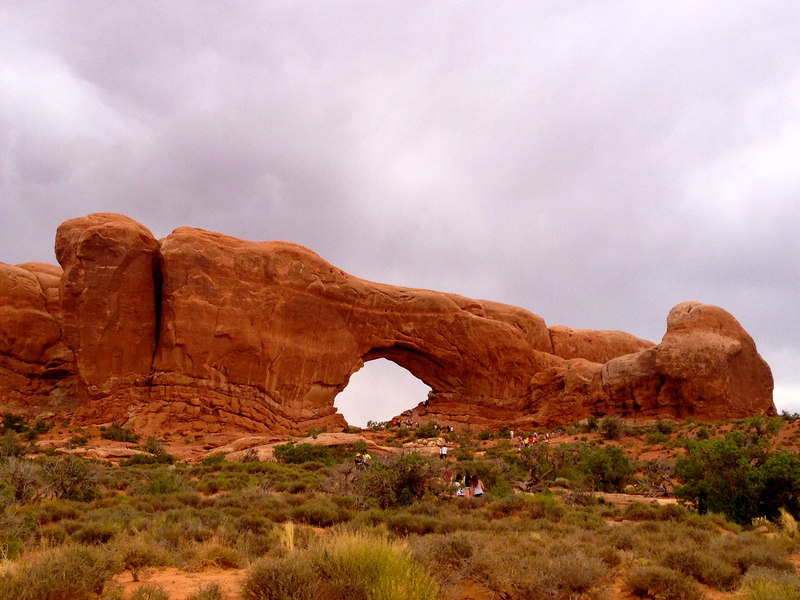 But the most unusual structures in this National Park, are the “arches” of course. Below is a photo of one of them. Most of these structures can be viewed by just driving around the park. 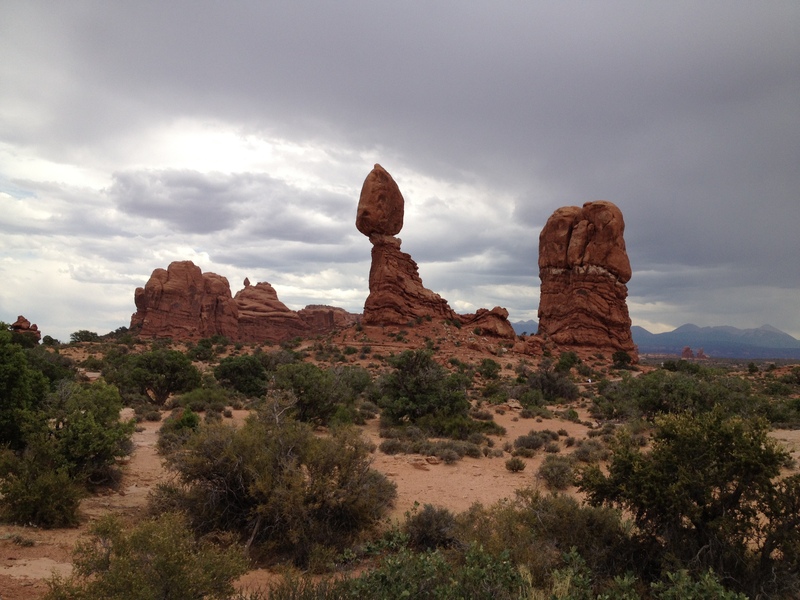 Yet the most recognizable structure and maybe the best known in the park is the Delicate Arch. However to see this beauty, requires a 3-mile hike round trip from the paved road. The hike is not so easy as well, as it is mostly uphill, and there’s even parts that the path is narrow and close to a cliff. During our first visit to this park, my son was only 3 years old at that time, but he was able to climbed up and see this arch. My fear then was not so much that he would get tired and I would have to carry him the rest of the way, but more so that he would wander off the path and fell off the cliff. But he made it through, and I was so proud of him. As for my daughter, she was 8 years old during our first visit. 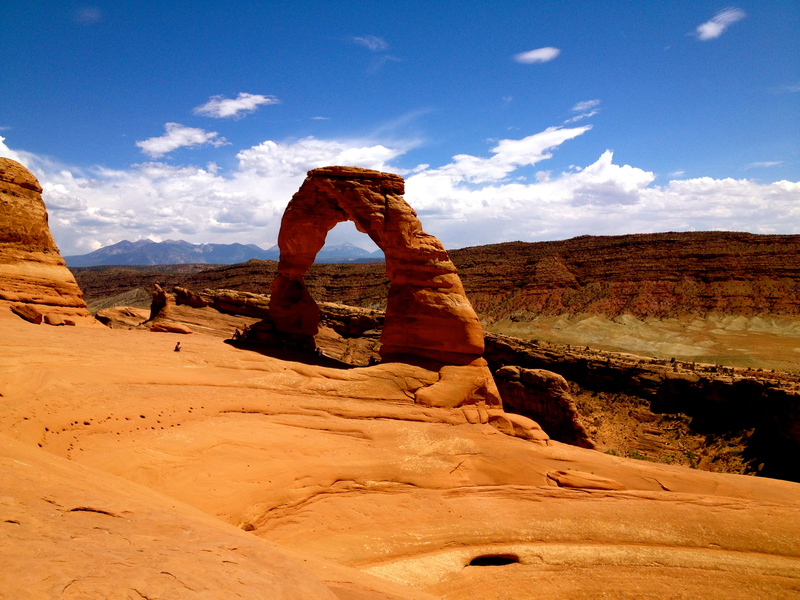 Unfortunately she got sick, with gastroenteritis, and was vomiting that day, and so she was unable to do the hike and was not able to see the Delicate Arch, for which she was deeply disappointed. 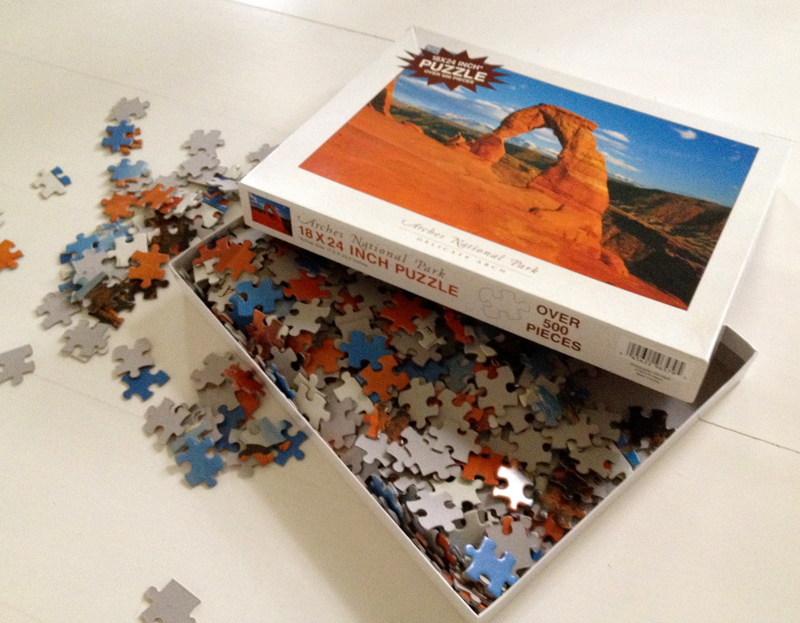 To appease her, we just bought her a jigsaw puzzle of a picture of the Delicate Arch from the Park’s gift shop. 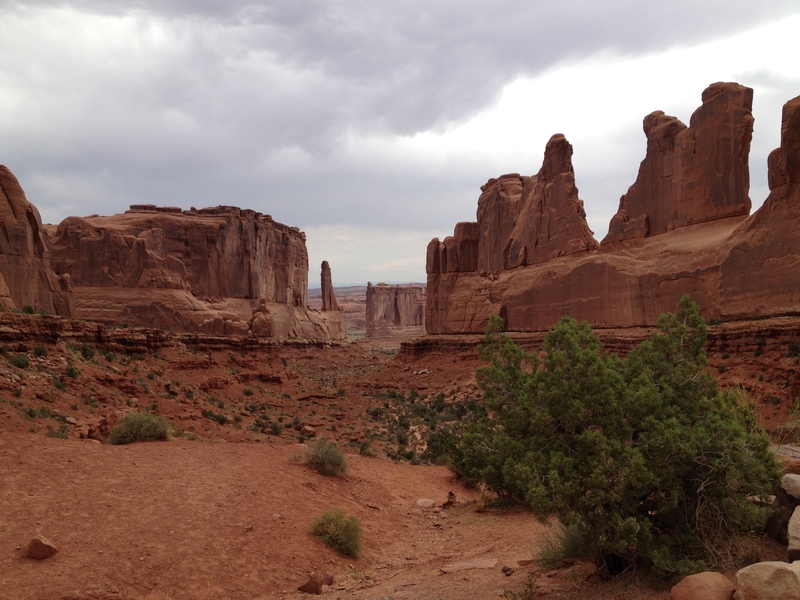 However, on our second visit, my daughter was determined to make the hike and see the Delicate Arch. It did not matter if it was not really part of our plan to do the hike, as our plan was just to drive through the park, for our final destination of that day was the Grand Canyon, which was still about 6 hours drive from Moab, Utah. It did not matter as well if the weather was hot as it was almost 100 degrees F and it was in the middle of the day. My daughter was so determined to see what she failed to see eight years ago. This time she would not be denied. So we did the hike. 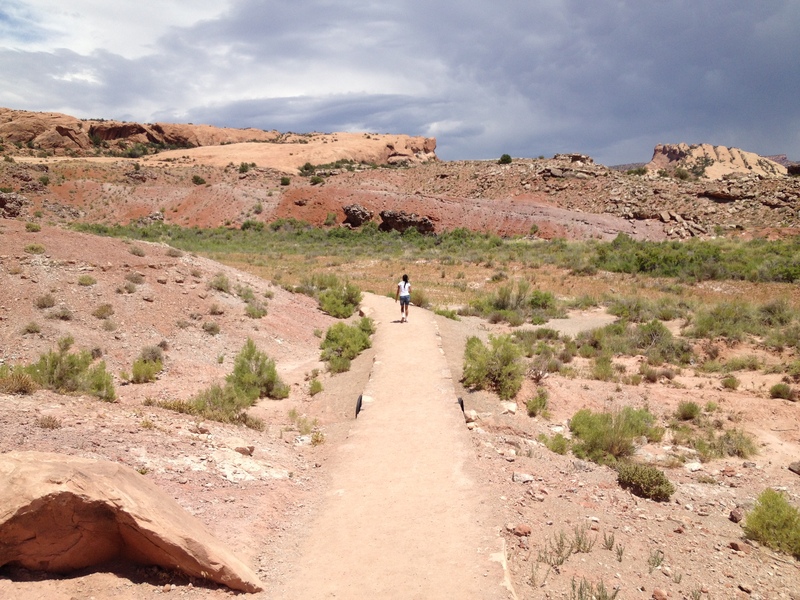 Above is my daughter on her way to the arduous and long hike to the Delicate Arch. Stopping to enjoy the “breathtaking” view. Or the hike was “breathtaking” so we have to stop to catch our breath. 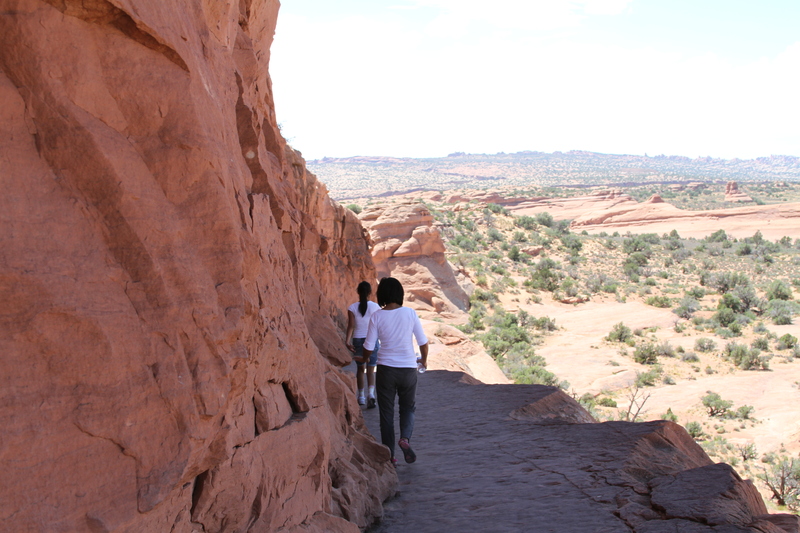 My daughter and my wife in the relatively narrow path, trying to stay away off the edge, which were hundreds of feet drop. 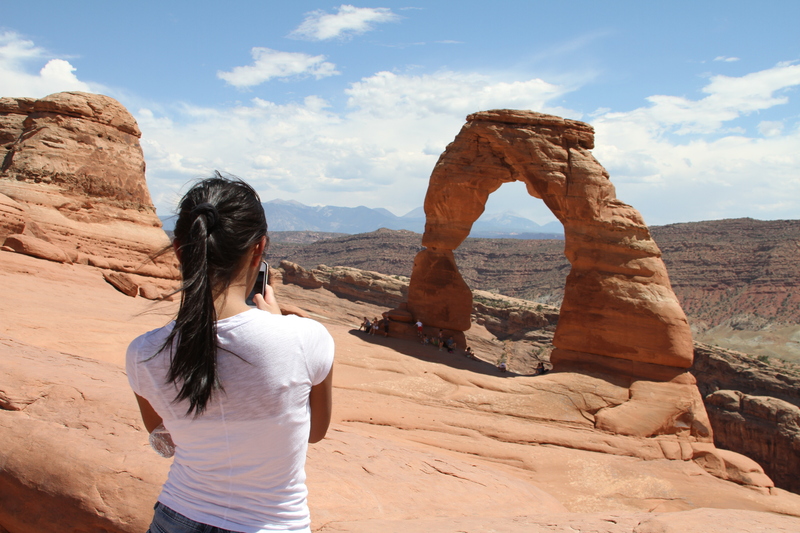 After some period of time of hiking, and several stops of rest; and after a lot of panting and buckets of sweat, here is my daughter taking a photo of the arch. She made it! With that kind of determination, I think she’s ready to explore and conquer the world. Or Mars, if that’s what she wants to do. A three mile 100 deg. 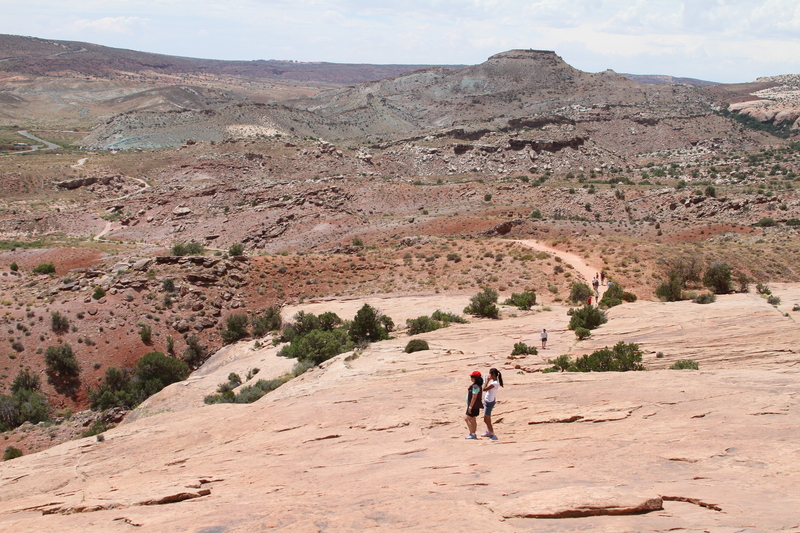 F noonday hike under the blistering sun to see the Delicate Arch, no thanks! Maybe, I’ll do it if I have an umbrella and the Kardashian sisters are waiting for me at the Arch to give me tight hugs and kisses LOL. Wow! It’s like being in another planet. Truly amazing, breathtaking images. I’m currently in the Philippines with it’s many arches of Nature and all. It feels good to be back to basic simple lifestyle. So much have change though. Prices of stuff crazy high, so many unfamiliar new development, traffic, more than ever…but the smiles and love of family, warmer than ever! Have a great Summer!